Thank you to Dr. Nasr for discussing the small hive beetle and its spread! 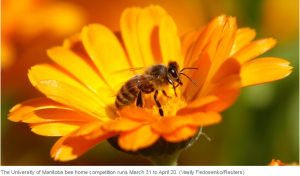 – 1/3 of Canada’s honey bees live in Alberta. 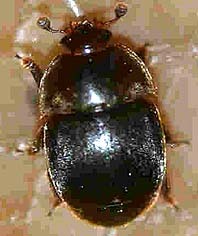 – Small hive beetle has been found in BC’s Fraser Valley and Southern Ontario, they are from South Africa. – The Small Hive Beetle is solid black or dark brown, about as big as a bees thorax, and doesn’t like the light. It feeds on honey and Pupae, and leaves a yeast which ferments honey, making it smell like rotting oranges. – A single brood frame = 6000 Larvae, the beetles move with bees. – Beetles will live with a cluster for up to 18 months, and will trick bees into feeding them over winter. – Strong colonies can isolate the beetle, and ensure it doesn’t spread. – Look under pollen patties for grubs – they love it. – Cappings left in a bucket are free beetle food – they love it! Try to extract in 2 days. Melt wax, and clean it another time. Try not to bring things from BC – buy Alberta Bees. Reduce Risk by Reducing Exposure. The EDBA is a not for profit organization which promotes awareness and education related to the honey bee (Apis Mellifera) and beekeeping in general. The EDBA has been providing beekeeper support for over 50 years! Currently, the EDBA has over 100 members who reside in the capital city region. Our members are both commercial and hobbyist beekeepers. Our meetings are held seven times throughout the year and often include informative guest speakers. Members are kept up to date on the latest advancements in beekeeping and bee health. Memberships are $25 / year and new members have access to the mentorship program which partners an experienced beekeeper with a beginner. Each spring, Alberta Agriculture offers an Introduction to Beekeeping class for beginners. Dr. Nasr hosts the event and he invites a number of guest speakers to share their expertise with the class. The class is two days long and incorporates theory with hands on practice. The course is typically held in late May – early June. See links for more articles dealing with various aspects of beekeeping. We happily welcome new members.